I am currently "remodeling" my reading process and offerings. I just want to help others find clarity, empowerment, healing, and spiritual expansion. I've been called an Old Soul my entire life, wise beyond my years, connecting to Spirit and divining wisdom for Self and others without realizing it. ...and, it's the experience that I seek for me or another when I throw down the cards. I've been a receiver of divine messages since I was a child, open and always full of desire to help. My approach to reading for others is the same as for Self - to gain clarity that provides space for Self empowerment, growth, and expansion. Do you need my birthday? No, I am an intuitive reader and can connect with your energy from your purchase transaction once you've given me permission to do so. What is a general reading? A general reading doesn't have a specific focus, it relies on my intuition to provide clarity on what the Universe/Spirit considers the most important issue for you to get information on. Can I ask a specific question? Yes. 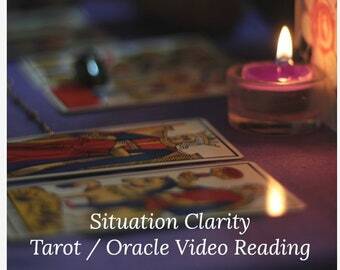 If you have a specific issue you want the reading to focus on just let me know and that's what I'll do the spread for.